Any help with this? I am on Windows 10. EDIT: I have the admin premissions and have turned off autoupdates in MikTeX. 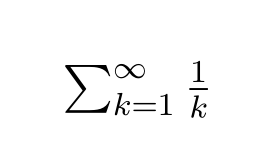 The series converges for p>1 and diverges for 0<p≤1. 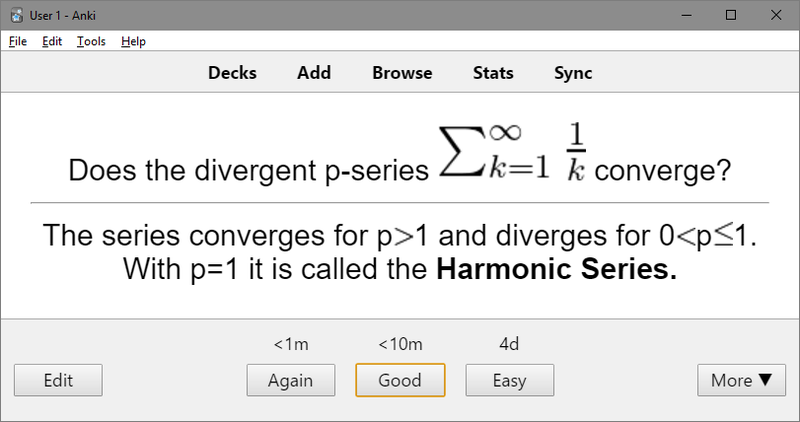 With p=1 it is called the Harmonic Series. Have you installed latex and dvipng/dvisvgm? IF you get other error messages then either your latex code is not right or MiKTeX has not been configured correctly. %temp%\anki_temp\tmp.tex (you can enter %temp%\anki_temp in windows explorer address bar to get there quickly) If you open tmp.tex in notepad then check/verify its contents are identical to the MWE shown below . It is best to run MiKTeX-console and ensure it is fully stable before Anki calls it in the background. The best way to check MiKTeX can run the same code as above is to use the included TeXworks editor and run the same minimal example until it works. Once you are confident that the above simple sample works with TeXworks IT should then work in Anki and in the temp directory (see above) you will find half a dozen files including two trace logs the short one is latex_log.txt (which Anki feeds back to the user) also is the more useful tmp.log with more useful information from the tex compilation. DO use the setting "Always install missing packages on the fly" until you have a stable setup, then (if you must) switch it to no. While you are there in the console ensure amsfonts and miktex-dvipng-bin-2.9 have been added to the active packages (there should be a date under "installed on", it has also been recommended to include passivetex and ucs packages to clear the above utf8x error, however the simple example above runs correctly without it. It is easy to add or remove it using + and -. Most importantly, periodically enter MiKTeX-console to manually force Tasks Refresh file name database as well as Refresh font map files this ensures your errors messages are minimal. Whatever the problem is with Anki this TeX forum will require to see the contents of tmp.tex (what we may call the MWE) within your question so as to see what caused any error messages reported in the logs. It may also be useful to add the [latex] blah bla blah [/latex] line you used within Anki (although that should by default be included in the tmp.tex that you post). If you customise LaTeX calling from Anki using the "Edit LaTeX build process" with the add-on from https://ankiweb.net/shared/info/937148547 or one of its variants then we will also need to know it was added and certainly what was changed especially if you extend to tikz or or other packages. Not the answer you're looking for? 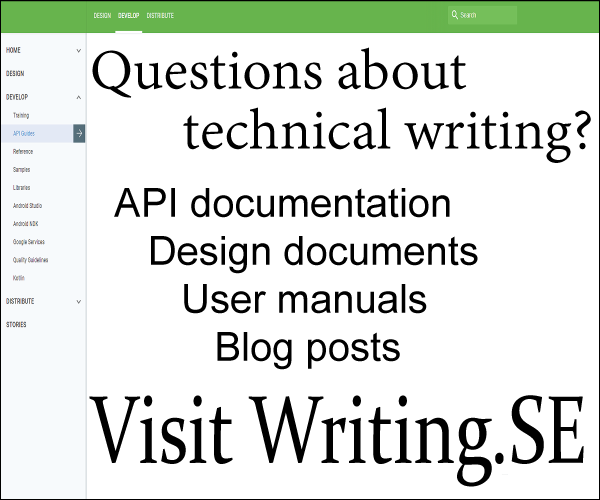 Browse other questions tagged miktex windows anki or ask your own question.